Meet the new vertical storage to the left of our stove. 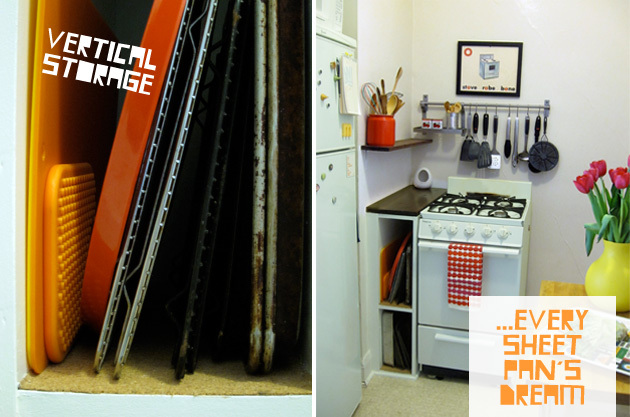 Here cutting boards, trays, sheet pans, bread pans are stored efficiently and ready for easy access. But it wasn’t always that way. 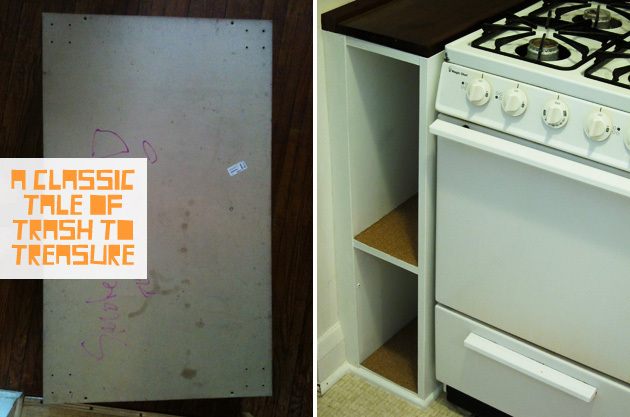 When we moved in, there was a counter to the left of the stove shoddily propped on top of two pieces of wood. 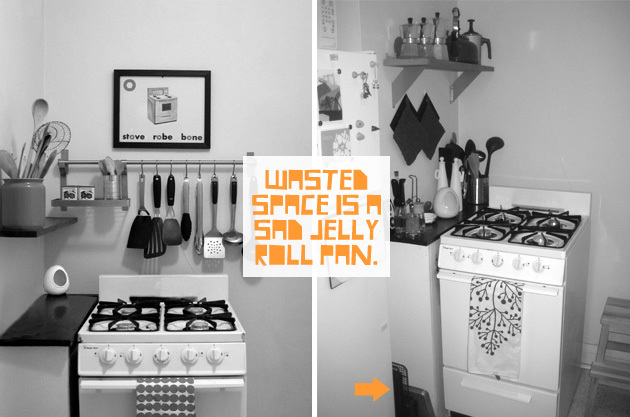 I’ve always wondered if there might be a cheap, easy way to turn the wasted space under the counter into something we could use. An easy answer didn’t show up until I found the remains of an IKEA Eneryda coffee table on the sidewalk near our apartment. Eneryda was sold with casters for its base and a sheet of glass supported on fours legs for its tabletop. When I found this one, it had one leg, no casters and the glass was long gone. Added was a not-so-clever slogan advocating illegal activity scrawled on the back in pink marker, a lot of sand, and water damage. After giving Eneryda a good cleaning to remove the accumulated street grit, I ripped apart the existing framing in the kitchen and slid our freshly trash-picked “cabinet” into place. While a perfect fit width-wise, Eneryda was about 4 inches too tall. As you can see in the above drawing, there’s a center board that divides the piece in half and creates four openings, two on each side. This meant the openings weren’t really deep enough for a sheet pan. Eneryda would have to adapt. My plan was to get the job done in three cuts — one for each of the side panels and one for the center board midway down. Two of the openings would stay as-is and the other two would become one, double-wide. Did you know Ace Hardware will cut wood — any wood — for $1/cut? If you’re an apartment-dweller with limited access to power tools, this is essential information. After a quick couple of phone calls to confirm the table saw at the Ace in our neighborhood was indeed operable, I disassembled the entire unit and gave it an additional cleaning of its discrete parts. I then measured and marked each of the cuts before heading off to the hardware store, where the cutting itself was quick and easy. With the new lengths ready to go, all I had to do was re-drill IKEA’s pre-made holes into the new “ends” of the panels. I started with the holes that went clean-through and then moved onto the shallow holes, taping the bit at the desired depth for each. After drilling, I reassembled the unit, put it in place and let it sit there for a week before I got around to painting it. During this time, I realized our kitchen floor isn’t really level, and so consequently a counter-top resting atop a cabinet sitting on that un-level floor would not be level either. I was going to need a shim. Shimming directly under the countertop would have been an option, but Tom suggested that I shim it on the floor. But there was a problem — how would I cover a triangular gap along the side of the new cabinet? Molding! I bought a length of quarter-round molding as well as some caulk to make up for any imprecision in the assembly. I also picked up a sheet of balsa wood to serve as facing for that space you can see in the above left image between the wall and the shelf. Balsa is probably not the ideal material in terms of durability, but it did meet the criteria I had in mind of “things that can be easily cut with an Exacto knife,” which was to be my tool of choice for trimming the facing so that it would hug the existing baseboard. Materials in hand, I set about painting, adding a cardboard backing, and installing the cabinet. 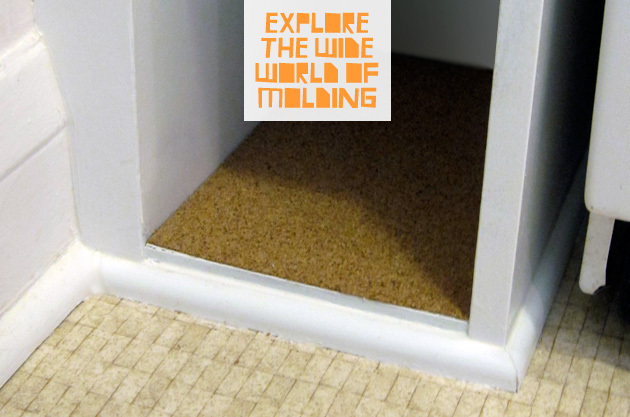 The molding and balsa wood worked well to finish everything off and perfectly concealed the wood shims underneath. I loaded staples into my staple gun to attach the backing and replaced them with brads to attach the balsa. Lastly, at the base of each shelf I laid pliant cork contact paper. We left the shelf to dry overnight and introduced the sheet pans to their new home the following day. This entry was posted by Martha on Monday, April 16th, 2012 at 8:54 pm and is filed under Apartment. You can subscribe to responses to this entry via RSS. Sooooo much better than before! And yes, for cheap make-overs! Martha–what an entertaining read! You are obviously clever in so many ways. It looks so good and what a good use of unused space. Wow. I am impressed. 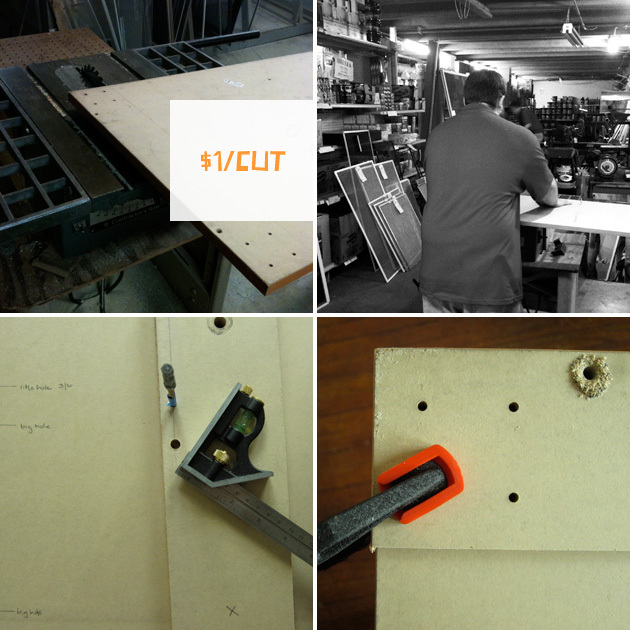 Excellent use of square, staple gun and drill -– all gifts from your father. Priceless!